I’m just gonna come out and say it. Sometimes I just don’t want to talk about food, which is pretty surprising because most days I could go on and on. I mean, I’m usually talking about what I want for dinner as I’m eating lunch. But not today. Trust me, I love when my belly is full. But my heart is so full after this weekend and that’s all I really care about. Pat and I drove up to Minnesota on Saturday to celebrate our friend who just bought a house – congrats Jeff!! Of course, I couldn’t completely forget about my stomach, so I brought plenty of snacks to get us through the drive. Jeff threw a wonderful party and it was the perfect summer night – brats, beers, and lots of friends. And I made salted chocolate chunk cookies because, let’s be real, every party needs dessert. We also celebrated the engagement of two other friends! And we were able to have brunch with my mom yesterday before we got back on the road. Seriously, so much love packed into 24 hours. I could not have asked for a better day. And now that my heart is full, it’s time for my belly. 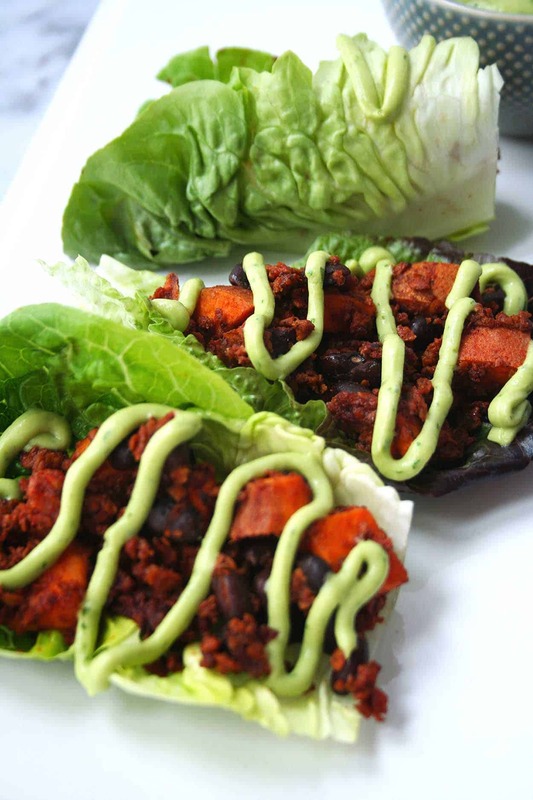 I have a Meatless Monday recipe for you – these lettuce wraps are made with a few simple ingredients – Trader Joe’s soy chorizo, sweet potato, and black beans – and can be on the dinner table in no time! Plus, they are made in one pan – I completely love using my cast iron skillet for this. I know you’re going to love them. 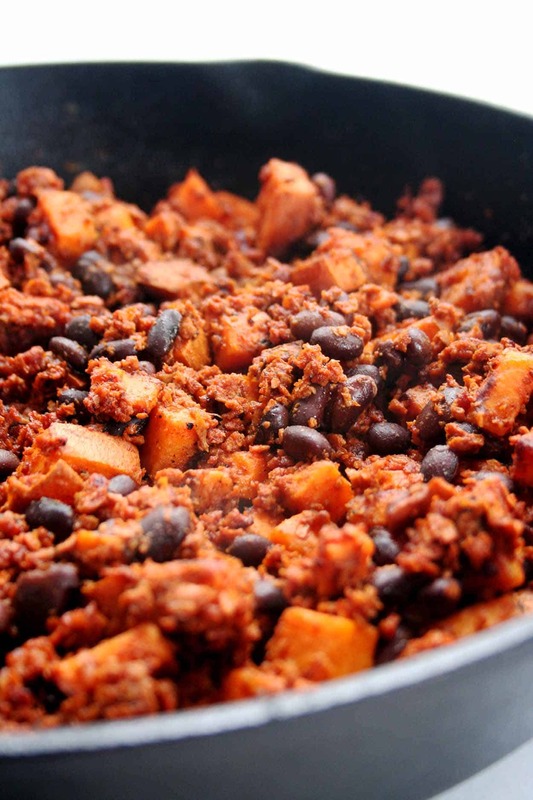 They are packed with protein from the soy chorizo and black beans. The avocado sauce is so creamy from the addition of Greek yogurt and it’s super healthy! This goes without saying, but chorizo is one of my favorite Mexican flavors and I could eat Mexican food every single day. So these are truly a win-win-win! Do you follow Meatless Mondays? I’m actually terrible at remembering, but I’m always looking for new meatless recipes… do you have any favorites?! 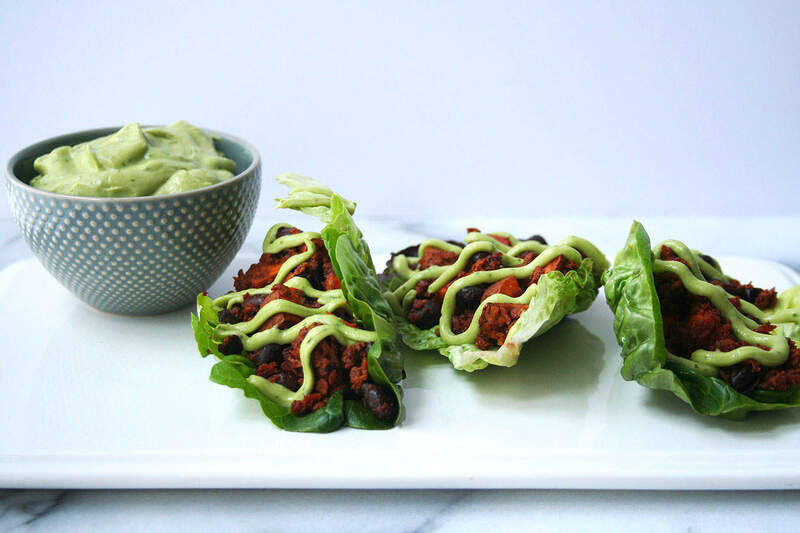 Join in on Meatless Monday and make these Soy Chorizo Lettuce Wraps – your belly with thank me. Don’t forget to follow me on social media so you won’t miss out on anything! Heat cast iron skillet over medium-high heat until hot. Add chopped sweet potato and olive oil. Sprinkle with salt and pepper and cook for 7-10 minutes until potatoes starts to brown and begin to soften. Cover skillet and cook for 10 minutes until the potatoes are tender. Remove potatoes from skillet. Remove chorizo from casing and add to skillet, cooking until the temperature reaches 165 degrees F, about 8-10 minutes. While chorizo cooks, make the creamy avocado-lime sauce. Add all ingredients to a food processor and process until smooth. If the consistency is too thick, add a little more olive oil or lime juice. 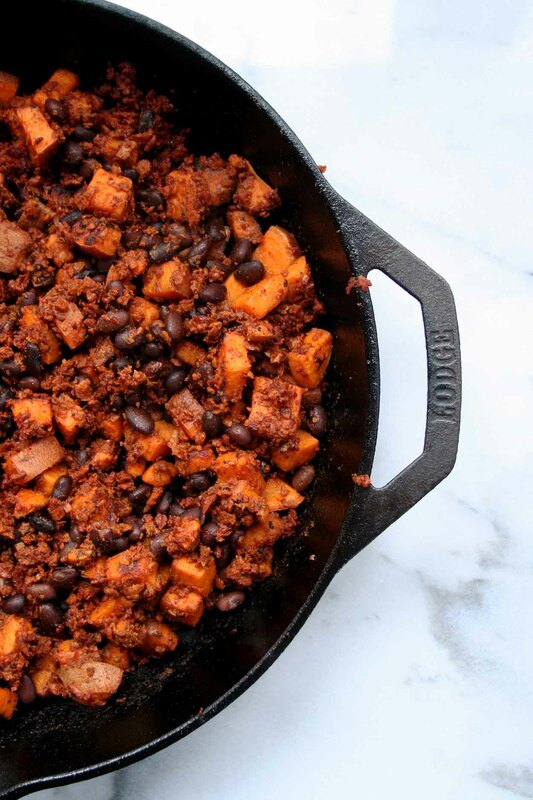 Add sweet potato and black beans into the skillet with the chorizo and cook until heated through. 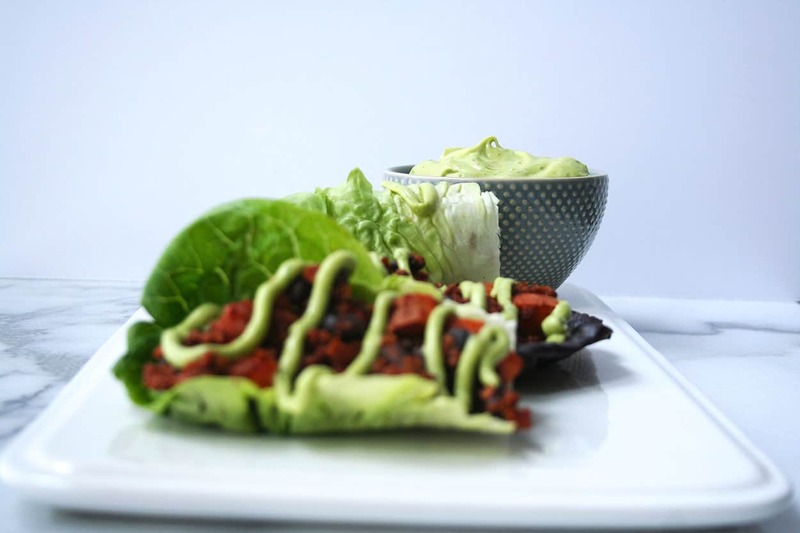 Serve the sweet chorizo mixture in bibb or gem lettuce topped with the creamy avocado-lime sauce! That avocado-lime sauce gives me life! ooo i love learning new soy meat recipes! one of my favorites is a veggie fajita – i’ll buy veggie minced meat, saute a BUNCH of veggies with it, and wrap it up with some salsa and sour cream. mm! Yum! I love all the flavors in this! I also love that you put all the goodness in a lettuce wrap – to lighten it up! 🙂 Looks wonderful! Thanks Jenna! 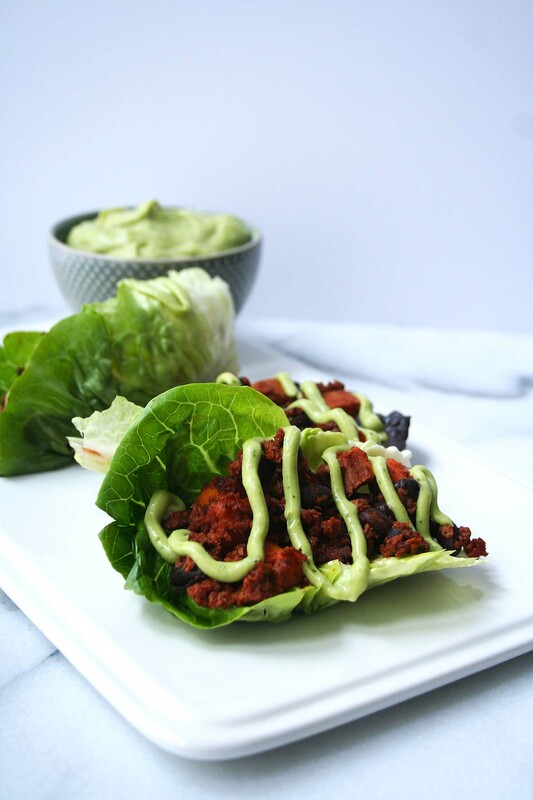 I’ve been on a lettuce wrap kick lately, but the chorizo has been my fave!! This is the perfect balance of flavours! 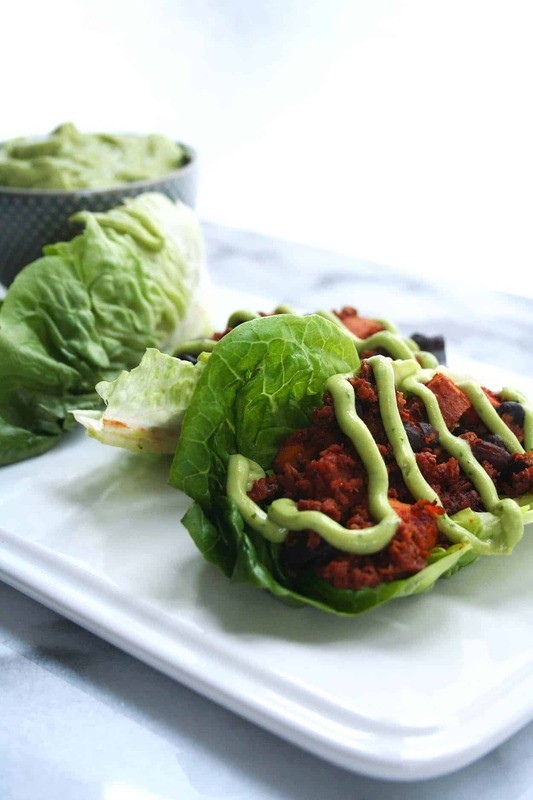 The freshness of the lettuce and the creamy avocado would be perfect with your chorizo filling! Yum! It sounds like you had such a lovely weekend! Thanks Caitlyn! Make sure you let me know what you think!! OMG they sound so good! I am gonna make them this weekend! Thanks Ana – please let me know what you think of them!